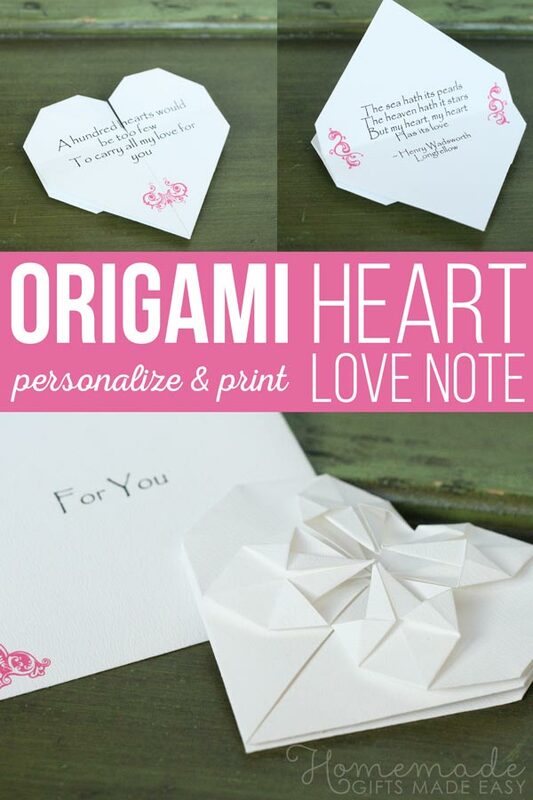 Learn how to make origami heart love notes to woo your sweet-heart! 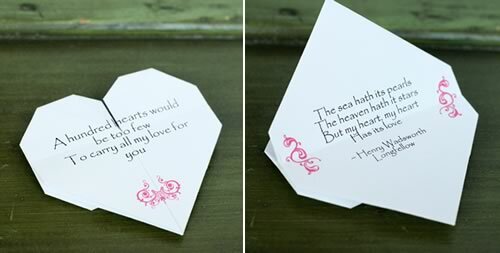 These love notes are so romantic, and you can personalize them for your special one. 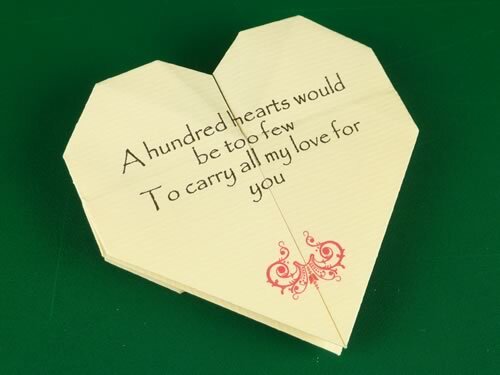 We've had money origami heart instructions up on the website for several years now and many people have used them to fold romantic cash gifts for their friends and family. 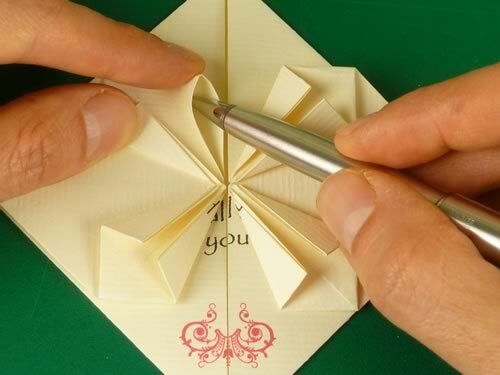 The instructions can also be adapted to fold sweet little notes out of plain or decorative paper. Amy from Eat Drink Chic used our money origami instructions to make a bunch of gorgeous little love notes for her engagement party invitations, and she made her own printable template for her readers to download. After several emails asking us for something similar, we've come up with a fully editable origami heart love note template that you can download, edit and print at home. 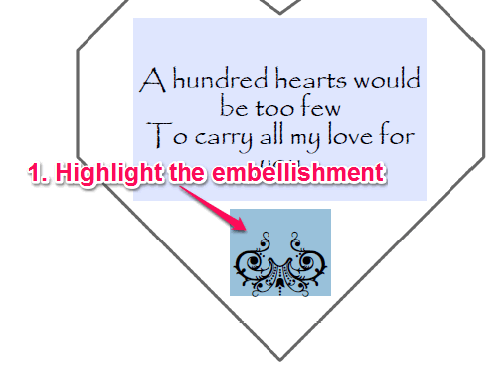 We've gone for quite a classic romantic design, but you can edit the text and remove the embellishments to suit your style. 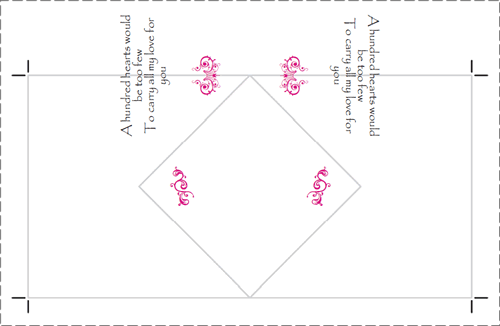 We've also included a printable envelope template that you can edit and print as well, so you can package your little love note perfectly for your sweet-heart! 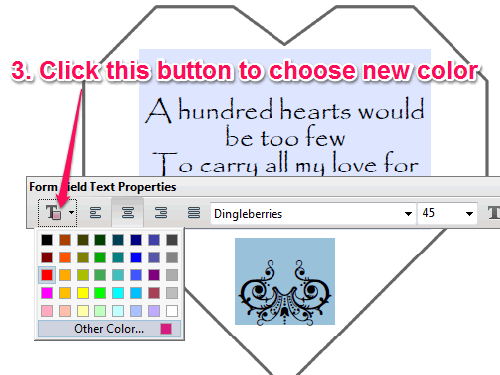 You can edit the quote on the outside of the heart, and write your own hidden message inside. Do check out our collection of Valentine card sayings and cute boyfriend quotes if you'd like some inspiration for messages to write in your love note. 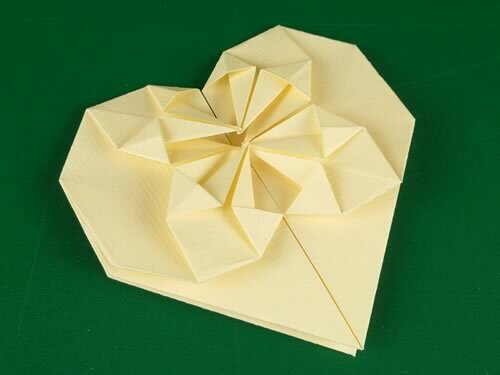 How to make origami hearts: what materials do I need? 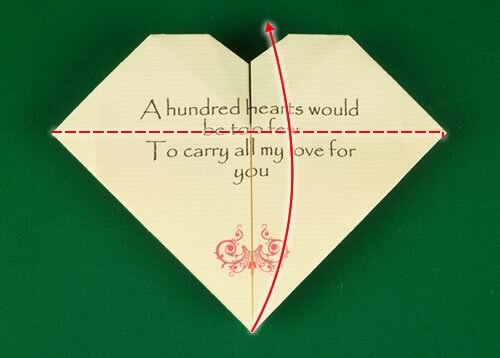 To make the origami heart you will need a sheet of paper twice as long as it is wide, e.g. 10 x 5 inches. To make things easy for you I've made a template which you can download. Just click the link below. 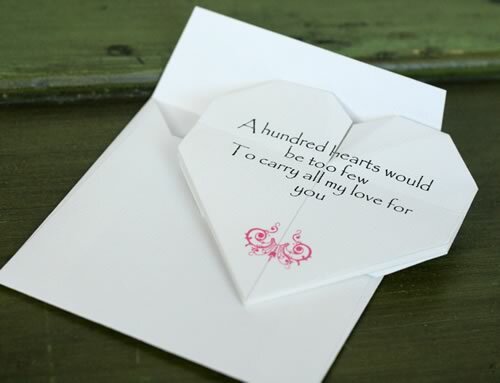 The template is pre-filled with a quote to appear on the outside of the heart and some embellishments. The inside of the heart is left blank for you to write your own message. 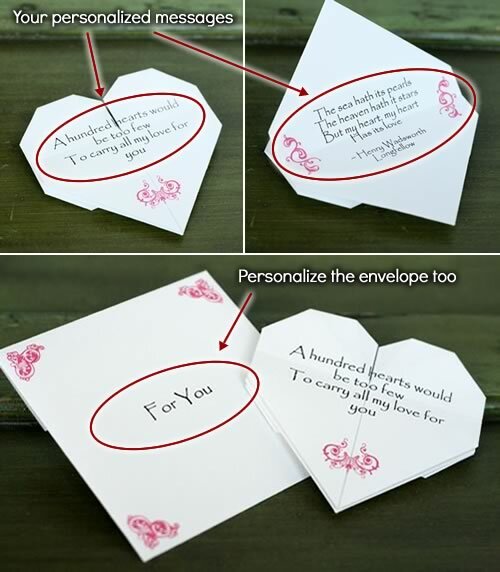 There's also a free envelope template designed to perfectly fit the heart. 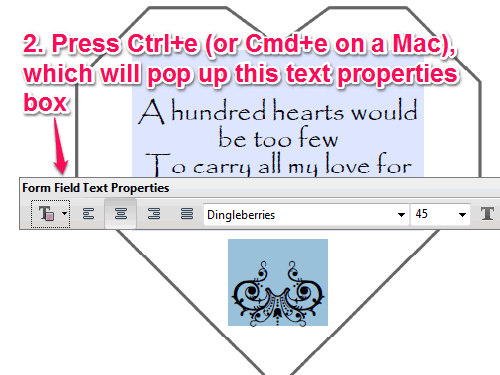 If you'd like to type your own messages on the outside and inside of the heart, then our personalizable template is for you. 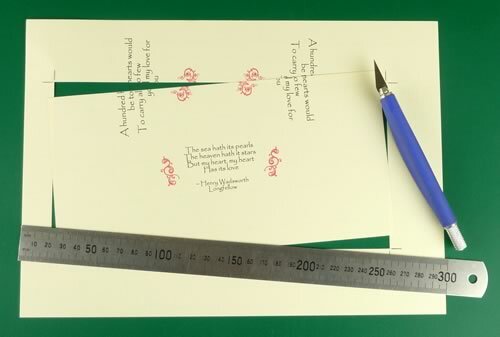 Make a love note for your sweetheart for Valentines day or your anniversary, or even use it to make unique engagement or wedding invitations. 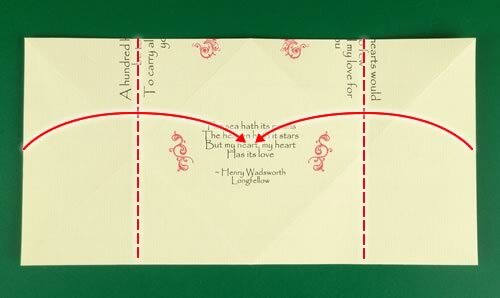 Easy to use - just type your message into the heart and it will automatically line up in the right place when you fold it. 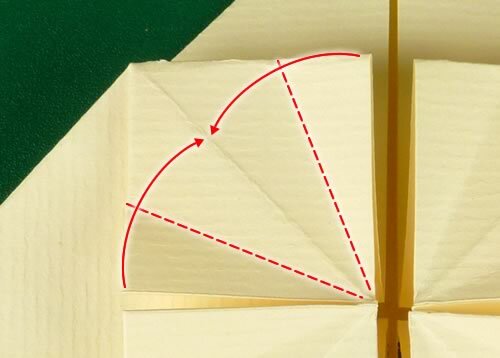 Here's what to do if the corners don't line up properly in the first fold. 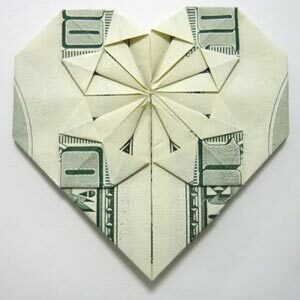 If you've folded our decorative money origami heart project before then you'll find this is almost the same. There are just some slight changes because we'll be using a different-shaped rectangle. Print the template . 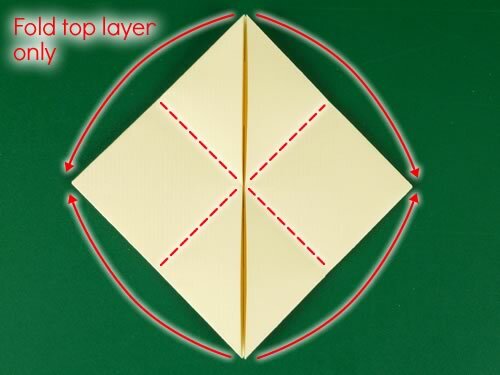 Use a craft knife and ruler to cut out the marked rectangle. Tip: If you're using the free version of the template, you won't see any text in the middle of the rectangle. 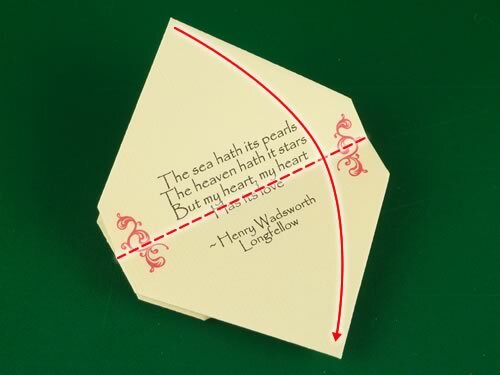 Instead, you'll see a diamond-shaped outline showing where you can write your message. This message will be inside the heart. 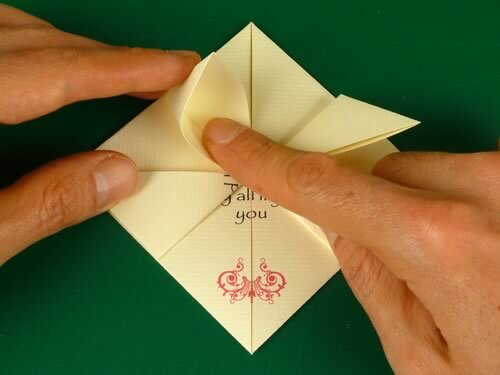 It's easiest to write your message now before you fold the heart. Place the rectangle blank-side-up. Fold up the bottom two corners to the top edge. You will see two parts of text line up like this. (If you don't see any text, rotate your paper 180° and try again.) This is your chance to get the text lined up perfectly, so take your time adjusting the folds until you're happy with how the text lines up . 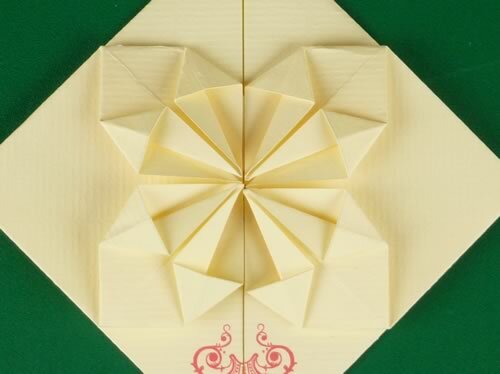 Making this fold accurately is the most important step of how to make origami heart love notes in order for the note to look good when it's finished. Undo the folds from steps 1 and 2. Then fold down the top two corners to meet the bottom edge. Undo the folds from step 3. Turn the paper over so the text side is up. 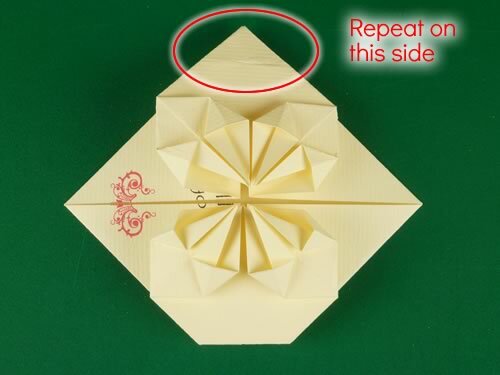 Then fold in each side to the center. You will be able to tell where the exact center is because of the creases left from the previous folds. Undo the folds from step 4. 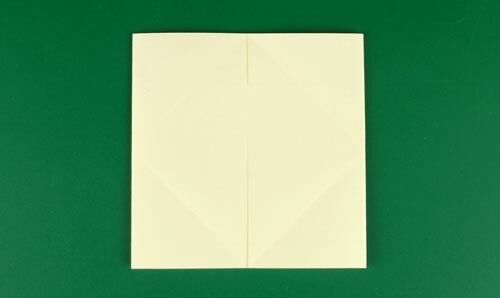 Place the paper blank-side-up in a "portrait" position. Pull inward on the left and right edges about 1/4 of the way from the top. Collapse the top section down into a triangle. 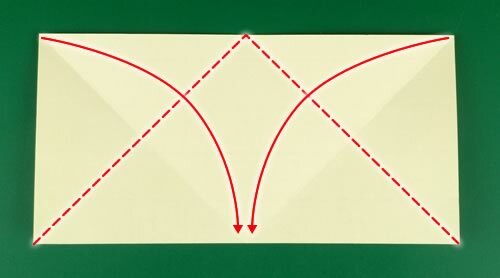 Rotate the paper 90° so that it is in this orientation (see below). 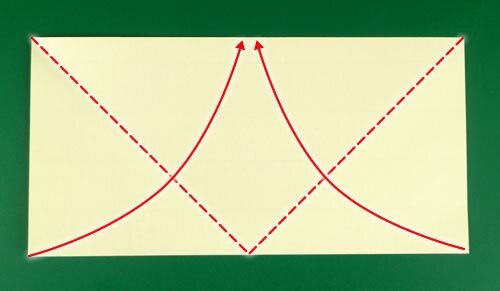 Lifting only the loose top layer, fold along the lines marked below. 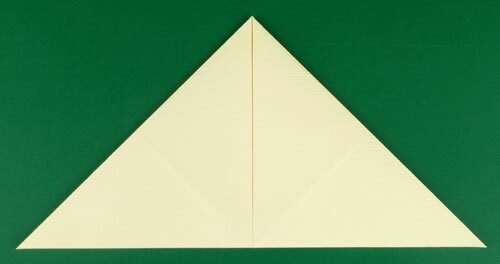 Poke your finger into the top-left triangular flap and open it out. 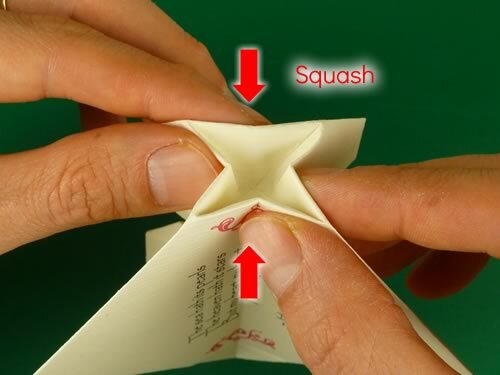 Squash the flap flat into a little square. Repeat for the other three flaps. Now you have four little flattened squares. 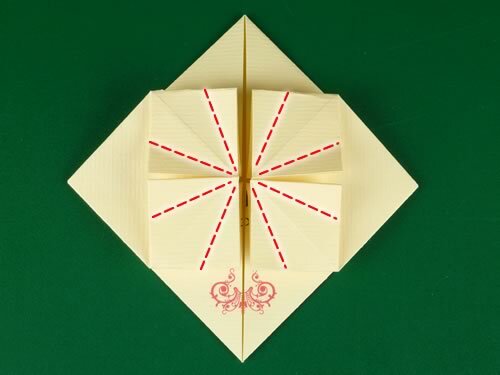 Fold in the sides of each square to the center, so that each square becomes a kite shape. Use the tip of a pen or another pointy item of some sort to open out one of the flaps in the side of one of the little "kites". 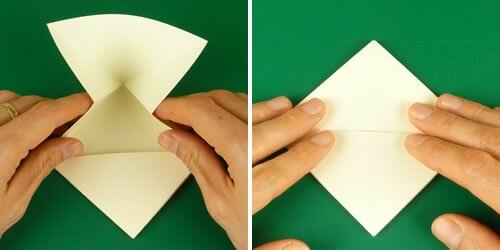 Turn the paper over and fold the top corner down to meet the bottom. You should then see the message on the outside of the heart (right panel below). If you don't see any text, it's because your heart is upside down, so fold the bottom corner up to meet the top instead. Turn over the heart so that the starburst pattern is facing up. 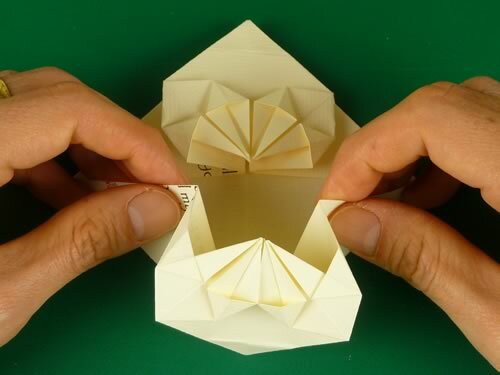 Fold in the left and right corners to "round off" the heart shape. Your heart is finished! The remaining steps are optional. All that happens in the remaining steps is that we tuck away flaps on the left and the right sides of the heart. That makes it a little easier to open up the heart and see the message inside, but it's strictly optional and your heart is perfectly good as it is. Undo the folds from step 10, turn over the heart, and fold in the left and right edges again on this side, along the same crease lines. Undo the folds from step 11. Grasp the bottom corner and lift it up, lifting only the top layer. Your heart will look like the left panel below. Turn it over, so it looks like the right panel below. 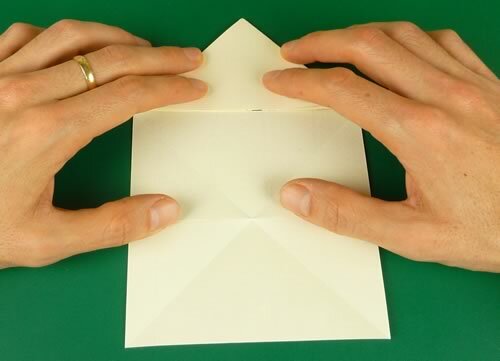 Rotate your hands away from you, so that a pointy bit of the paper is pointing toward you. Press in the point, using your thumbs (or whatever fingers you have free :-). You want the point to collapse into a flat square. Then press it in even a bit more so that it becomes a shallow hole. It can be a bit fiddly so take your time. Place a finger on each side of the square, then press in on all the sides. The square will collapse like this. 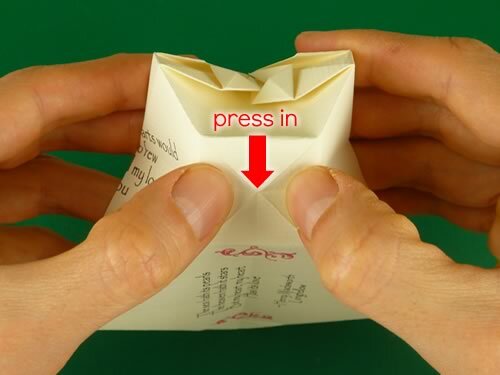 Press on the top and the bottom to squash it. 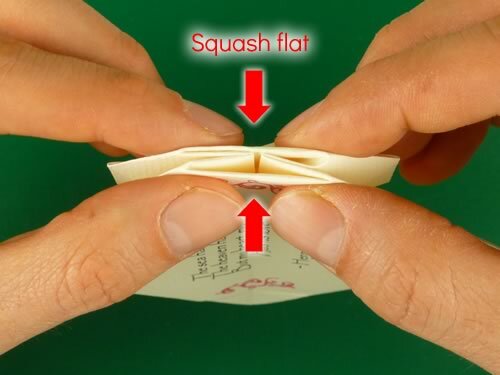 Keep squashing until it's flat. Phew! Well done! 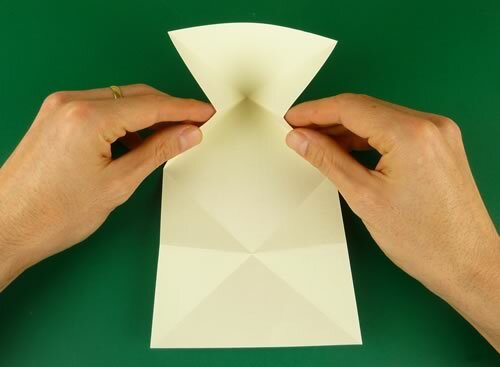 You just did an advanced origami fold called a "sink fold". That was probably the trickiest bit of how to make origami hearts. You just did a sink fold on the corner on one side of the heart. Now all that's left to do is the other side. So, repeat step 13 for the other corner. I hope you enjoyed this tutorial :-) If you have any questions or just want to say hi, please comment on how to make origami hearts . If you purchased the personalizeable note and envelope kit then you can change the color of the "swirls" to be whatever you fancy. First, open up the template in Adobe Reader and highlight the embellishment whose color you want to change. Press Ctrl+e on your keyboard (or Cmd+e if you're using a Mac). That will cause a text properties box to pop up. Press the button that looks like a "T" with a little square next to it. This brings up a selection of colors for you to choose from. You can also choose "other color" to see more color options. You can also use this exact same method to change the color of any of the text. "I'm using these for our wedding RSVP's and they're perfect!" "I was going to use these for my wedding invitations, but I thought they were a bit small." Then I came up with the idea of using them for our RSVPs and they're perfect. They look really cute! 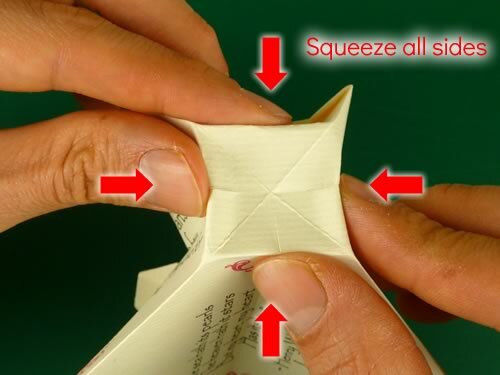 We're having Japanese food at our wedding so I was looking for something origami-related to keep with the theme. I've made 50 and I've got just under 100 to go. I love lining them all up on the table to see how many I've done. I'm using a cream parchment paper and it looks really old fashioned, really cute, and the tiny folds on the back of the heart are so pretty! "I don't think anyone is going to believe I made them." It took me about half an hour to do the first one but now I can do them in three minutes. They look like they've been made professionally. After doing the first few I can do them really neatly now, like I'm some kind of origami machine! I found the hardest part of how to make origami hearts was the squash fold. When I first did it it was driving me bananas! But now I can do it in seconds. "The best thing about the template was how easy it was to edit it to personalize it." That was amazing, because I don't know how I would have been able to create that on my own. To have something to just download and change was really cool. When I made them I didn't realise that I could change the color of the embelishments, but I happened to be using a filigree stamp in almost exactly the same color on the invitations, so actually it matches really well anyway. "Another thing I like about the hearts is how they're kind of 3D"
I think the most effective origami things are 3D, but I had to be able to post them. 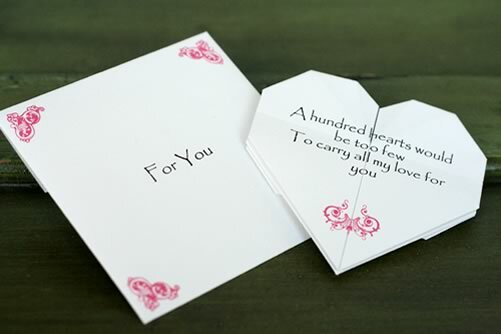 What's so nice about the heart is that it's flat but it's also three-dimensional as well because you can open it out. It's really impressive and beautiful. I'd looked into other options like a 3D origami water lily but it was going to be ridiculous, really expensive (about $10 each!) to get them made and posted in individual boxes. 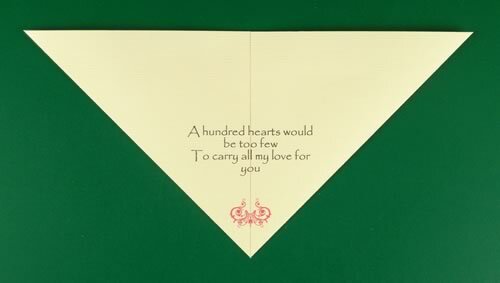 So I was looking for other things that were equally impressive and cute but would fit in an envelope and that's why I think the heart was a perfect choice. 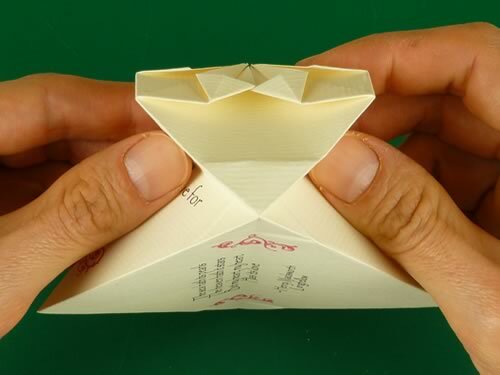 I'm thinking of taking the RSVPs that people post back and making some kind of display out of them for at the wedding. I've got a feeling that once everyone sees them hanging beautifully at the wedding they'll be asking me where I got the idea from... I might be a serious trendsetter!